“It’s a road map to the Other Side. Take a left at the cemetery. Go down Highway 666 until you hit a dead end. Heralded across the country in publications ranging from the New Your Times Book Review and the Baltimore Sun and the Denver Post, and magazines as diverse as Chicago and Library Journal, the Haunted America series has attracted widespread acclaim. Haunted Heritage continues this terrifying journey through the highways and byways of North America. 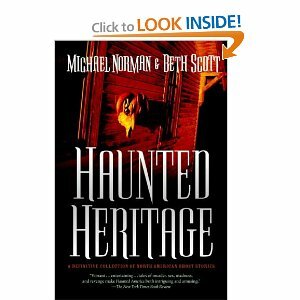 Haunted Heritage recounts Michael Norman and Beth Scott’s unearthly explorations of supernatural fokelore that has been passed on by word of mouth and preserved by memory. Drawing on eyewitness testimony, newly rediscovered ancient archives, overheard tales, and actual paranormal visitations, the authors have compiled an astounding collection of American ghost stories. From its spine-tingling survey of university ghosts to an overview of eerie spectral lights, from tales of renegade revolutionary spirits in New England to beyond-the-grave hauntings in the Badlands, Haunted Heritage is the definitive ghost-story collection for all of North America. Its chilling tales will not be easily forgotten. To check out this book or find more like it, please stop by or call your local library. The following is information sent to me by John York, the founder of UROPA (Utah Reserachers of Paranormal Activity). These are the EVP (Electronic Voice Phenomenon) that we cannot explain. They are open for interpretation as to what may be said or even what some of the noises are. We do label according to how they may sound when we analyize. These are captured with different recording devices so the recordings may sound different. They have not been “altered”. If you have headphones, grab them. Please let me know what you think. 1-The 1st one is in what we call the “Moose Room”. I asked if there was a little girl around and what her name was. This male voice seems to respond about 15sec later. 2-“SCLfemaleBR”- Myself and Dylan were alone on this side of the library and in the main womens bathroom. Sounds like a female voice and then a male. 3-“SCL3hallvoice” Downstairs hallway by stairwell behind office. Voice? 4-“SCL5brightlight”- My favorite. Multi-Purpose room. Two voices. Young girl. “bright light” and “of course”. Very cool! 5-“SCLitissomething”- To me, sounds like it ends in “son”. Kelly hears this at the time and I believe she starts to say “Wow”. 6-“SCLman” Sounds female to me. Moose Room. 7-“SCLman in moose corner” Its speaking as Kelly asks “are you a woman”? 8-“SCL media rm noise” A knocking sound that was heard in media room. 9-“SCLnot found”- To me, it has an “S” sound. I would love hear back from you on what you think you hear.